Inspired by a dessert served at Duc’s Bistro in Honolulu, Hawaii. Bowl #1 - Pour out the thin coconut milk/liquid from the can into this bowl. Bowl #2 - Scrape the coconut cream from the can into this bowl. Bowl #3 - Measure out 1/2 cup coconut milk from Bowl #1 and put it in this empty bowl. 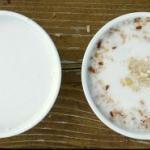 Add 2 tablespoons of the coconut cream from Bowl # 2 and set aside. Cut bananas into ¾-1 inch pieces. Set aside. In a medium pot, bring the water to a boil over medium heat. Add tapioca and reduce heat. Simmer for 12 to 14 minutes, until the tapioca nearly cooked, stirring occasionally to prevent sticking. Do not overcook: at this point, the tapioca should be thick, and individual pearls should be clear on the outside, and have a very small dot of white in the middle. Add the salt and the coconut milk mixture from Bowl #3 and to the tapioca stir to combine. Increase heat to medium. When the tapioca mixture begins to simmer, add the banana pieces and stir. Reduce heat and simmer for until the bananas are tender, about 2 minutes. Remove from heat. Stir in vanilla. Add sugar one or two teaspoons at a time, tasting between additions, until it is sweetened to your tastes. 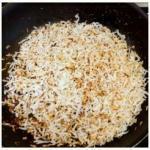 To toast coconut, place ½ cup sweetened flaked coconut in a small ungreased non-stick pan. Stirring constantly, cook over medium heat until coconut is lightly browned. Immediately remove from pan and cool on paper towels. Distribute individual servings of banana-tapioca mixture into small bowls. 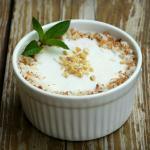 Pour a thin layer of prepared coconut cream (from Bowl #2) over the top of each serving. Garnish with finely chopped nuts, toasted coconut, and mint leaves. Serve warm.